2.5 to 5.5 inch Dia. 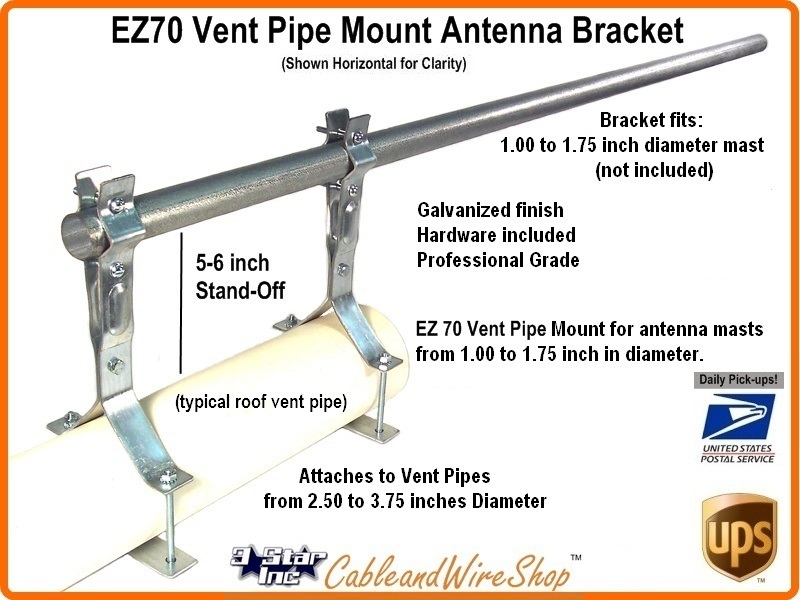 Easy Up EZ 70W Roof Vent Mount - for Vents 2-1/2" to 5-1/2"
Note: The Vent Pipe used for this attachment must be of Sturdy Stuff (Steel, Ceramic or Equivalent. NOT PVC or Aluminum Foil! ), otherwize you will witness a Whole Lot of Shakin' Goin' On with your TV Antenna and Mast! Great for Antenna Masts from 1 to 1.75 inches in Diameter. 1.25 inch diameter Masts are the Standard for Off Air TV UHF/VHF/FM Antenna. Though most TV antennas can be mounted to 1.75 or even 2.00 inch Diameter Masts. Keep the Mast length as Short as Possible, and limit the Dish Size to 20" or less. If Mounting a Off Air TV Antenna, the size of the Antenna would be limited by the amount of Cantilever achieved to offset the torque generated by wind load (increase the distance between the 2 clamps as antenna size goes up!). The Standard is a 1.66 or 1-5/8 inches Diameter Pipe size in most Universal Mounts for Satellite Dishes. Whether Aftermarket or Service Provider supplied, this mount can accomodate even large Dishes for DirecTV (1 and 3 LNB only, the World Direct International uses 1.75" DIA Mast and the Ka/Ku HD Band uses 2" DIA Mast), Dish Network 500+/1000+, Dish 500 Plus, Dish 1000 Plus, DishPLUS, Dish Network TurboHD 1000.4, Dish 1000.2, Dish Network 1000.4, DishPro, 105 SuperDISH, 121 SuperDISH, EchoStar Technologies Corporation, most FTA Free to Air and DBS Direct Broadcast Satellite Dishes. In addition, it can be used in mounting some smaller PCS, Cellular, Broadband Wireless, Wireless Internet and Two Way Antennas. Our roof mounts are made for quality by manufacturers with a history in the field of proven success and longevity. Whether you are planning to install your antenna and mount to the roof peak, gable, vent pipe, chimney or pitch, plan your installation to minimize the structural and aesthetic impact to your house or building. Height is the key in optimizing your ability to capture the best line-of-sight possible to your target. To get reception is to get above obstructions that exist between you and your target. As you increase your target distance, you increase the territory you must account for in maintaining line-of-sight. The roof of any building provides a logical platform of height in which line-of-sight is more likely to occur, or from which, more height can easily be obtained.